The table below outlines the 3 types of those changes and gives an example of MRI appearance for each of them. 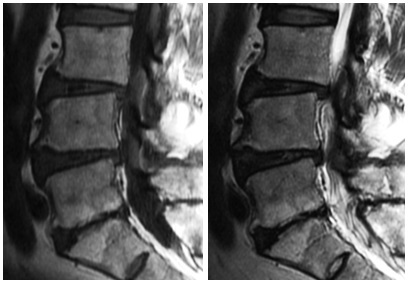 Modic Type 1 changes are hypointense on T1-weighted imaging (T1WI) and hyperintense on T2-weighted imaging (T2WI) and represent bone marrow edema and inflammation. They are associated with disruption and fissuring of endplates and formation of a fibrovascular granulation tissue. Modic Type 2 changes are hyperintense on T1WI and isointense or slightly hyperintense on T2WI and associated with conversion of normal red hemopoietic bone marrow into yellow fatty marrow as a result of marrow ischemia. 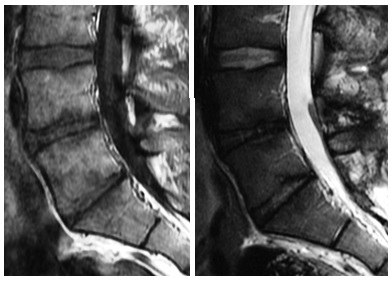 Modic Type 3 changes are hypointense on both T1WI and T2WI and represent subchondral bone sclerosis. Mixed-type 1/2 and 2/3 Modic changes have also been reported, suggesting that these changes can convert from one type to another and that they all present different stages of the same pathologic process. 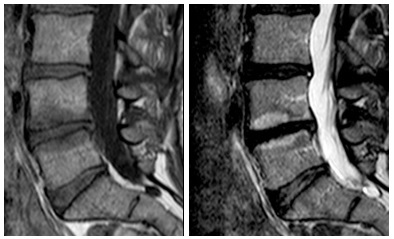 Differentiation between degenerative changes of vertebral endplates and bone marrow and spondylodiscitis can sometimes be problematic. The table below outlines some characteristics of the two pathological processes.